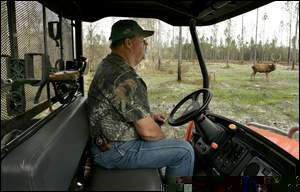 Ken Copeland, operations manager of Hurley's Waccasassa Plantation in Fort White, is shown with a red stag on Monday. The 1,700-acre hunting preserve offers hunters access to native and exotic species of deer and asian water buffalo. But Ken Copeland said he's had to chase down a white-tail deer that escaped over the barrier, which encloses animals put there to be hunted. "We paid for them . . . We're responsible," said Copeland, the hunting preserve's operations manager. The preserve recently opened to the public, but has already raised the ire of animal-rights advocates. They say the practice of fencing animals for hunts - which they derisively call "canned hunting" - is cruel because it creates docile animals that are easy to kill. "I don't think that it serves any purpose at all other than give lazy hunters who have some money an opportunity to kill deer," said B.J. Perkins, who lives near the plantation. Perkins has distributed posters protesting the hunting practice and is lobbying state lawmakers to stop it. The state regulates, but doesn't ban hunting preserves, which are prevalent across the region and charge hunters thousands of dollars to kill species native to other continents. There are about 60 fenced hunting preserves in the 17-county region that includes Alachua County, said Ken Holmes, a state fish and wildlife investigator who inspects the properties. A hunting preserve in Cross City, Dixie Sportsman's Hunting Lodge, advertises opportunities to hunt exotic animals such as wildebeests for up to $7,000 and offers "handicap hunting" for those using wheelchairs. Suwannee River Ranch in Branford touts the chance for children to be able to kill a trophy animal, showing pictures on its Web site of kids posing with dead boars, rams and goats. State regulations ban hunting "tame" animals, require exotic species to be kept behind 8-foot fences and mandate preserves with deer species be at least 200 acres and covered with 50 percent vegetation. Holmes inspects preserves when they open to determine if they meet the size requirements, and returns about once a year after that. Animals are deemed tame if they don't flee when approached, he said. Waccasassa Plantation has followed all state guidelines, according to Holmes. Owner Tom Hurley made his fortune in the mining industry before deciding to establish the operation for his retirement, Copeland said. The preserve, which has a Branford address but is located in Gilchrist County, will cost $17 million when completed and include clay shooting, fishing, camping, a restaurant and other attractions. But it's the fenced hunting that has brought criticism. Native deer are enclosed in a 1,000-acre area, while exotic animals are fenced in a nearly 700-acre section. Guides accompany hunters in pursuing exotic species, including axis buck, black buck antelope, red stag and Asian water buffalo. Hunters are charged $350 to hunt in either of the sections, but those who bag exotic animals pay additional fees based on the size of its antlers - which can stretch up to $7,000 for huge trophy sets. "If he can afford it, he can shoot it. If not, he can take a picture of it," Copeland said. The Humane Society of the United States estimates there are more than 1,000 hunting preserves in at least 28 states. The society and other groups have lobbied against the preserves, getting Indiana to ban the practice this year and other states to restrict the hunting of lions and other large carnivores. Even some hunting groups have questioned elements of the practice. Safari Club International supports fenced hunting but is drafting guidelines to ensure animals aren't caged in small areas, said Terry Vane, North Florida chapter president of the group. "A hunting area that is a pen is not a hunting area," he said. But animal rights advocates argue that no matter the size, animals kept behind fences and fed by people become less fearful and easy prey. Perkins stops some mornings on her way to work to watch deer as they amble by the fence line at the Waccasassa Plantation, saying the animals don't seem scared when she approaches. "I don't think the deer have much of a chance," she said. Copeland said most prized bucks are elusive and difficult for even hunters to find. Unlike some preserves, he said, the planation offers just the opportunity to hunt there and no guarantee of killing any animals. "These aren't canned hunts," he said. "We're not killing Bambi here." Nathan Crabbe can be reached at 338-3176 or crabben@ gvillesun.com.